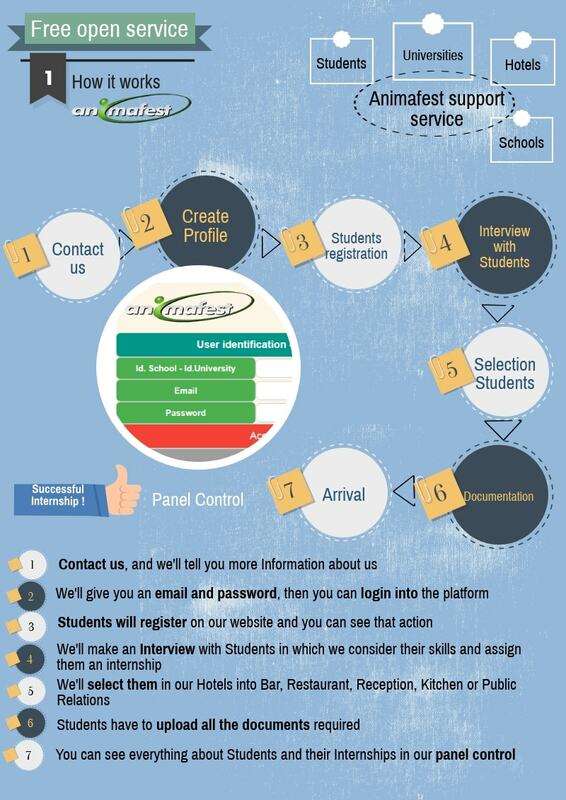 We would like to offer the opportunity for your students to do the internship in different departments of our hotels. We are a platform; we help students all around the world. Your Students can do the Internship in more than 450 hotels. We cooperate with 1800 Tourism and Gastronomy universities and schools worldwide. We offer internships in the field of the Hospitality sector. Registration is free of charge as well as equipment for the entire registration. Your Students can choose from our Internship positions (Restaurant, Bar, Kitchen, Reception, Public Relations, and Animation). Our services are totally FREE. Hotels with 3, 4, 5 stars in the most popular touristic destinations. Students will see everything on the personal page. There they can put the important information like CV, Photo etc. We offer an advice on documentation, agreements, insurance, etc and also access to our 24 hours online platform to contact the Animafest office in order to assist you. When you are interested don’t be hesitate to contact us. Could you send us one marketing@internships-spain.com incase you have students interested?